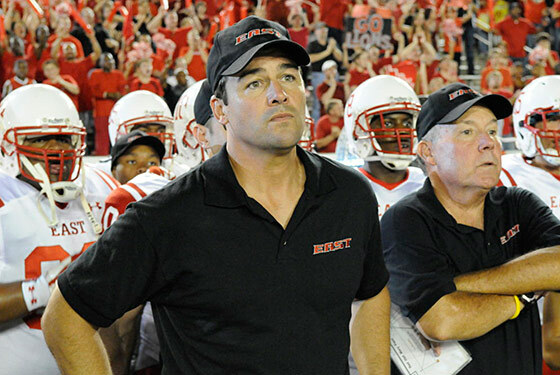 Coach Taylor said in the Friday Night Lights pilot that we would all be tested. Well, here we are. Friday Night Lights ends tonight for the dozens of people watching it on NBC, but it ended months ago for those among us who either have DirecTV or lack scruples about watching things on the Internet. In that time, we’ve developed some coping strategies for how to deal with Dillon withdrawal. We hope they help you in your time of need: Clear eyes, full hearts, can’t lose — right? 1. Watch the whole thing again. You’ll be surprised how much you forgot. The story lines are as you remember them, but the ratio of, say, Street/Riggins/Lyla to Julie/Matt/Landry in the first season is not at all how you remember. (Way more Lyla than you think.) The Landry murder subplot, while still not great, is nowhere near as atrocious on second (fifth, sixth) viewing as it was at first. There are also a number of characters who pop up and then vanish — wither Santiago! — and it’s nice to see them one more time. Plus the little character tics take on huge importance. When Tami raises her eyebrows to help make her point, that’s like a special little prize you just won. 2. Sample some other shows that prominently feature teenagers. Maybe it will scratch the same itch? Degrassi imports a good chunk of the Landry murder story in its upcoming season, and while that story line is more appropriate on the soapy (amazing) Canadian import, of course FNL did it with more emotional integrity. Make It or Break It focuses on elite athletes, one of whom suffers a severe, paralyzing injury, but the gymnastics series lacks any gravitas whatsoever. The kids on The Glee Project are driven, talented, and in need of guidance, just like the Panthers and Lions, but they’re also often phony and irritating. All of this sampling just helps crystallize the image of Coach Taylor’s greatness, however, and may send you back to suggestion No. 1. 3. Resign yourself to the fact that you will probably give Battleship a chance. Peter Berg made you care about Texas high school football. Maybe he (and Taylor Kitsch) can make you care about battleships, no? It’s not as lyrical and beautiful as Friday Night Lights, but with FNL showrunner Jason Katims in charge, Parenthood operates on the same emotional wavelengths. Sometimes good honest people make mistakes, you know? All you can do is love them more. It’s true.